Mostly we take our trees for granted. But this is a thought-provoking fact about our oldest citizens, the trees. One tree produces approximately 260 pounds of oxygen yearly, and that means two mature trees can supply enough oxygen annually to support a family of four! So we need to take proper care of these living treasures with timely tree trimming. What are the benefits of tree trimming? For all of the natural beauty and appeal of trees, tree pruning and trimming can be a dangerous task affecting you and your property. So call on the professionals! As trimming experts, we take extreme pride in the quality of our tree services. 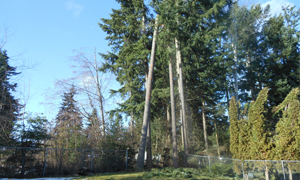 Call us for tree pruning, trimming, crown cleaning, and thinning services in the Bonney Lake area. 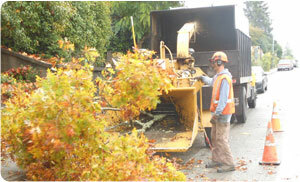 While all trees may not require annual trimming, tree pruning is a continuing process throughout the life of a tree. And few exceed the level of arboriculture services and knowledge provided by our team of ISA certified arborist and ISA certified tree climber specialist. Wise trimming techniques are among our key objectives in promoting overall health and growth for our longest living organisms on this earth. 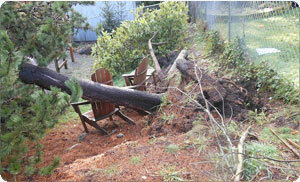 Call us today with your questions about professional tree pruning in the Bonney Lake area. We are a family owned and operated tree service business that was founded in 1986 and built on decades of combined education and experience in the science of arboriculture. Trees are important to our ecosystem for a number of reasons, including the fact that without trees, human life could not exist on earth. Everything we do is based on the important role trees play, and our desire to contribute to their health.